Do you remember Defiance? It was an online, open-world shooter from Trion Worlds where players fought over alien technology on a sci-fi Earth. It even had a TV show, which went for three seasons before being cancelled by Syfy, and the story was eventually continued in the game. Well, now Defiance (the game, not the TV show, that’s still dead) getting completely revamped, with a new Defiance game, Defiance 2050, coming out later this year. For a different MMO to play, here’s our list of the best free-to-play MMOs out there. Defiance, according to SteamSpy, has had roughly 20,000 plays in the last couple of weeks, but a peak concurrent of just 454 yesterday. It’s due something to boost numbers, then, and Defiance 2050 is being described by Trion Worlds as thedefinitive Defiance experience, compared to the original game. PC Gamer were hot on the button to catch the announcement, and built as a free-to-play game, it’s fundamentally different to the original Defiance, with “brand new systems, gameplay mechanics, and cutting edge graphics.” Assuming it’s all in-engine, which looks likely, you can see those cutting edge graphics in the trailer above. 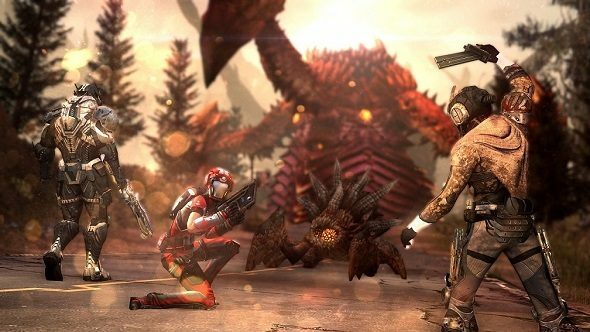 The official website describes the game as having “massive co-operative battles,” so it sounds like it might be more akin to Planetside 2 than the original Defiance. Fans will likely see exactly what those battles entail soon, as closed beta signups are now live on the official site. On top of that, they’ll be streamig the game every Friday at 10:30 PST (13:30 ET, 18:30 GMT, 19:30 CET, 05:30 AET on Saturdays) on their Twitch channel. The landscape of games has change a lot since Defiance released in 2013, so, perhaps it’s going to catch up with the times, because “online sci-fi shooter” really is a very 2013 game description.